Shuri Castle is located in Shuri district of Naha City. It is yet uncertain when it was built exactly, but it was clearly in use as a castle for the Kingdom of Ryukyu from 1429 through 1879. 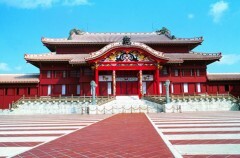 Shuri Castle was the main administrative center, the focal point of foreign trade, as well as the political, economical and cultural heart of the Kingdom of the Ryukyus. The original form of the castle was burned down during the World War II, after which the area was used as the campus of Ryukyu University until 1975. And after the Ryukyu University moved to Nishihara Town, the castle reconstruction started and was completed in 1992. In 2000, along with other gusuku and related sites, it was designated as a UNESCO World Heritage Site.